Image courtesy of Library of Congress An Army General and later President, Zachary Taylor earned the nickname "Old Rough and Ready." Taylor's military exploits in the War with Mexico made him the first individual to recieve multiple Congressional Gold Medals. On this date, Speaker of the House Robert Winthrop of Massachusetts signed the enrolled bill bestowing a third Congressional Gold Medal on Major General Zachary Taylor. The only individual to receive three Gold Medals, Taylor received the awards in the span of two years for service in the Mexican–American War. 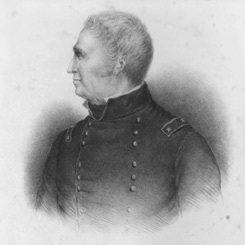 On February 7, Representative Alexander Stephens of Georgia introduced the measure to thank Taylor and his men, who withstood an assault by General Antonio Lopez de Santa Anna’s Mexican Army at the Battle of Buena Vista. Greatly outnumbered, the American force held its position and halted the advance of General Santa Anna. The resolution to honor Taylor passed the House 181 to 1. At the time of its passage, there was no adulation or objection to Taylor’s receipt of a third gold medal. The Congressional Gold Medal was originally given as a national expression of appreciation for distinguished military achievements or to commemorate life saving heroics (particularly water rescues). The medal evolved to include recipients who have made major contributions to society. Besides Taylor, seven other individuals who served as U.S. President also received a Congressional Gold Medal: George Washington, Andrew Jackson, William Henry Harrison, Ulysses S. Grant, Harry S. Truman, Gerald R. Ford, and Ronald Reagan.